Our cozy cottage is right in the heart of wine country and overlooks Seneca Lake from the east side, so the sunsets are amazing and filled with spectacular colors. Set among summer cottages and homes in a rustic/country-style neighborhood, our property has 45 feet of lake frontage with a dock. Depending on the weather and day of the week, the atmosphere on this uncongested lake ranges from calm and peaceful to joyful and fun. Our newly renovated cottage features a luxurious bathroom with a whirlpool tub, an open floor plan between the kitchen and living room, and a deck with a comfortable patio set and gas grill. There are two sliding glass doors that lead from the living room to the deck, which allow for nice lake views through the surrounding trees. Four adults or three adults and two children can sleep comfortably in this one bedroom cottage with a queen-size bed, a twin-size bed, and a full-size pullout couch. The lakefront has a shaded area with a bonfire ring and picnic table, as well as a sunny dock. 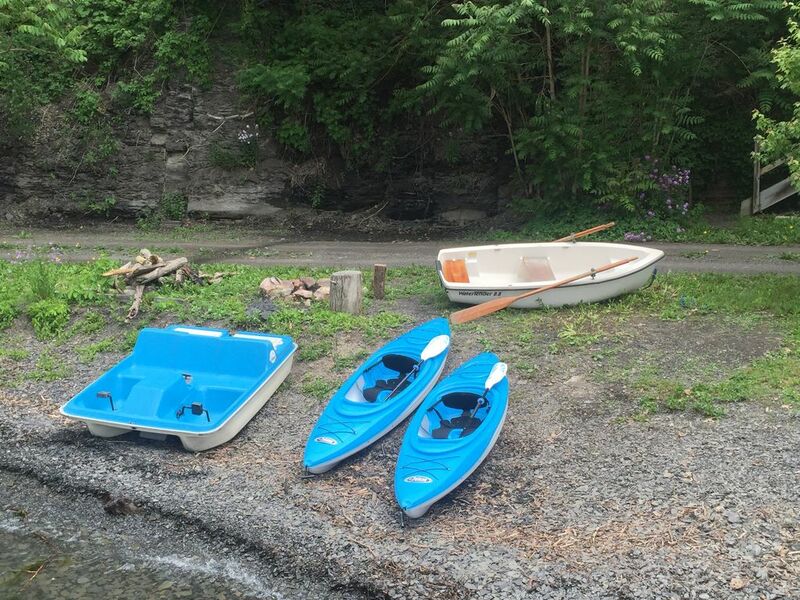 You can borrow the owner's 2 kayaks, peddle boat, and row boat, and use camp chairs that are kept in the boat shed. There's something for everyone, including swimming, boating, kayaking, long walks along a dirt road through vineyards, fishing, and romantic evenings watching the sunset and drinking local wine. - access to the lake frontage from the yard is by way of a sturdy staircase or by a short road that goes around the neighborhood (about 1/4 mile to our frontage). The staircase has about 75 steps. The run for the steps is 11 inches, which is nice, and there are three decks with benches, in case anyone needs to rest or wants to see the view. It's also very handy to be able to drive down if you're carrying coolers, towels, etc., or are taking some small kids down all at once. The road is for limited use, especially on busy weekends, but it is there when you need it. The surrounding area is incredibly dense with wineries overlooking the lake. You can have a great time touring the area and tasting wines. THERE ARE MORE THAN 10 WINERIES AND A BREWERY WITHIN A 10 MINUTE DRIVE, AND ONE WINERY WITHIN WALKING DISTANCE. The property is 15 minutes from Watkins Glen, home of the Watkins Glen International Race Track and the Watkins Glen Gorge. At the Glen Harbor Marina, take a ride on Captain Bill's Sightseeing Boat, the Seneca Legacy Dinnercruise Boat, or the Malibar/True Love Sailboat. Our cottage is also surrounded by the Finger Lakes National Forest, with hiking trails. You-pick fruit orchards and honor-system fruit and vegetable stands are available frequently during the summer and fall. Skyland Farm, a fine-craft gallery with items from 500+ artists and a feeding farm, is a must-see. The cuisine in the area is delicious with dining atmospheres ranging from casual to elegant. Many of the restaurants offer local, farm-fresh foods. Two miles across the lake, the Rainbow Cove Restaurant has slips for boats. For those willing to drive a little farther, other attractions include the Museum of the Earth, which is 30 minutes away, and Ithaca, NY (a 50 minute drive), with many musical venues and a wide variety of international cuisine. The Corning Museum of Glass as well as the Rockwell Museum are also 50 minutes away in Corning, NY. Some of the festivals and events held in the area include the following. Wireless internet is available, and you can use up to 0.25 GB of data per day for free. If you use more, then we'll take $2.50 out of your security deposit for every 0.25 GB above your allotment. This was our second year staying in this cottage. The lake view is lovely, and the cottage had everything we needed to enjoy our four-day stay! Second time in this adorable cottage, and so happy about our stay! Beautiful views on the lake, conveniently located reasonably close to Watkins Glen and our pups loved the access to the water!! The place is cute and has everything you need for a lovely stay. Good cardio workout going up and down the stairs to the beach. Fenced yard is great for the dogs. Only down side was the bed is not at all comfortable. The mattress makes noise every time you move. You do have to drive every where. Pick up groceries in advance because you have at least a 30 minute drive to the store. Wegmens is worth the drive. Mike and Mary are fantastic hosts they provide everything you could need to have a great stay. We arrived to a cool house (98 degrees outside) the AC work wonderfully when indoors. The lake was another great escape from the heat. Kayaking was also fantastic, and we were treated to some local firework displays. Sunsets, stargazing and even a couple of fire pit nights when it cooled down. We will be back again. The cozy cottage was as advertised. Great location, perfect views, and very clean. Great experience. It was everything we were looking for in a vacation and rental. Perfect for dogs. Mike and Mary were gracious hosts and answered all questions promptly. Mike and Mary are very accommodating and make your stay comfortable and easy. The weather was fantastic, the views are stunning. My wife and are are fit so the stairs are not an issue. There are spots to stop and rest if you need. The grill works perfectly. If you want a peaceful quiet getaway this is the place for you. Location is awesome for the wine trail. Some of the best wineries are within three miles of the house. The surrounding area is incredibly dense with wineries overlooking the lake. You can have a great time touring the area and tasting wines. There are 10 wineries and a brewery within a 10 minute drive, and one winery within walking distance. The property is 15 minutes from Watkins Glen, home of the Watkins Glen International Race Track, Watkins Glen Gorge, and Glen Harbor Marina. It's also surrounded by the Finger Lakes National Forest, with many nice hiking trails. You-pick fruit orchards and honor-system fruit and vegetable stands are available frequently during the summer and fall. Skyland Farm, a fine-craft gallery with items from over 500 artists and a feeding farm, is a must-see. The cuisine in the area is delicious with dining atmospheres ranging from casual to elegant. Two miles across the lake, the Rainbow Cove Restaurant has slips for boats. Check out their breakfast! Check-in is 4 pm. Check-out is 10 am. Guests must get approval to have more than 5 occupants. Pets must also be approved. Absolutely no smoking allowed inside the house.